Before we get into Max Ernst’s surrealist masterpiece, Europe After the Rain II, we need some background. First things first: the artist. 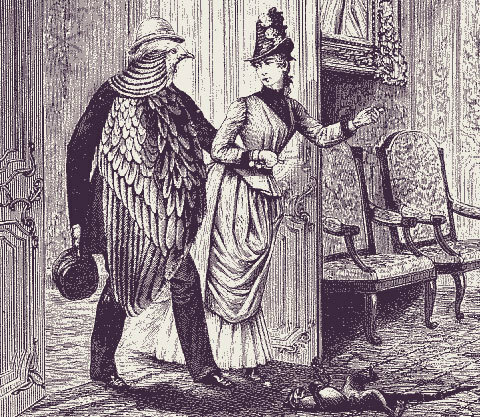 , which is an excellent example of Ernst’s revolutionary work in this medium. As a painter, Ernst invented the surrealist technique of frottage – making rubbings of textured surfaces and working with the forms that emerged. He developed upon this by inventing grattage – scraping paint off of a canvas with a textured surface underneath. He also developed upon the concept of decalcomania (an early image transfer technique) by pressing wet painted surfaces together, creating strange forms that he would then develop upon. These three techniques are related to the surrealist practice of automatism (free improvisation without self-censorship). Basically, these techniques are the artistic equivalent of rorschach blot tests – a means to channel the subconscious and allow the artist to escape the tyranny of meaning. Of course this also makes it hard to talk about what a painting “means”. 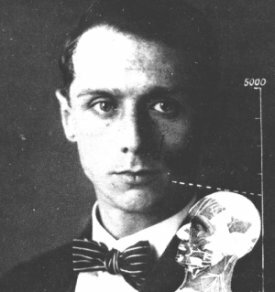 Max Ernst was born in Brühl, Germany and studied at Bonn University. He was already an exhibiting artist living in Paris when WWI broke out – as a German citizen, he was drafted by the German army and rather than face the prospect of being sent to a French detainment camp, Ernst accepted the draft call and fought at both the Eastern and Western fronts, mostly as a map charter. On the first of August 1914 M.E. died. He was resurrected on the eleventh of November 1918. Over the following years Ernst built an impressive career as an artist. By the time WWII rolled around, Ernst was in France again, and this time was interred as an enemy alien in a detainment camp. His friends (including Paul Éluard) managed to get him released, but when the Nazis invaded France the Gestapo came looking for Ernst (who had been deemed a “degenerate artist” by the Nazis) and he escaped to the U.S. with the help of Peggy Guggenheim – to whom he was subsequently married. This brings us to 1940-1942, the years Ernst painted Europe After the Rain II while living in New York. 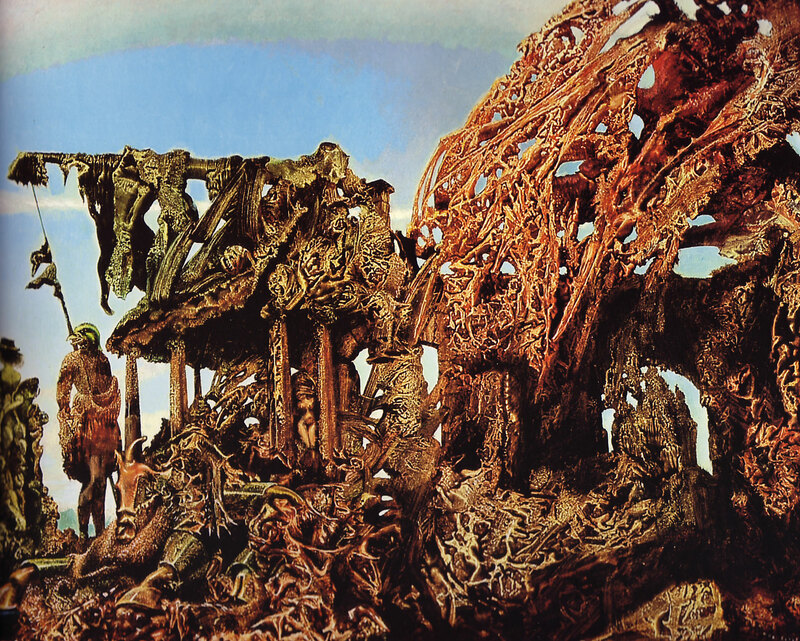 This painting makes extensive use of the techniques Ernst invented, portraying a ravaged landscape reminiscent of both twisted wreckage and rotting organic proliferation. Are we witnesses to an apocalypse, or uncontrolled, cancerous growth? True to Ernst’s methods, there is no definitive interpretation, but given his personal history, his flight from the Gestapo into self-imposed exile, and his disgust at the effects of war, it’s not hard to see a restrained melancholy on display. In a landscape reminiscent of classical paintings of ruins, the figures could be overgrown statuary, or semi-mythical survivors of a forgotten war. A helmeted, bird-headed soldier threatens a female figure with a spear – or perhaps a ruined battle standard. Perhaps it is an allegory for the destruction of European civilization. Perhaps it is a denouncement, showing that once the dignified veneer of civilization is stripped away, only chaotic masses of half-formed nightmares remain. However you take it, Europe After the Rain II is a powerful image that provokes more questions than it answers, and a true masterpiece of Ernst’s ouevre. is an excellent book that includes many colour reproductions of the best of Ernst’s work including Europe After the Rain II and many others from this period of Ernst’s artistic career. Ernst finally did move back to Paris, where he died in 1976. Wow, I loved your terrific article.